I've been to Jak's Grill in the U-District plenty of times for Brunch. Yesterday I went there and had their Chorizo Benedict. I've had most of their Benedicts and Scrambles, but the Chorizo is one of my favorites. The poached eggs are stacked on Chorizo patties and bread with hollandaise sauce and pico de gallo salsa. The benedict is served with a side of Jak's potatoes. The poached egg and hollandaise sauce are good, and pretty much what I would expect in a good Benedict. 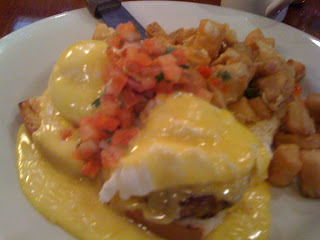 What I really liked about this Benny is the flavorful Chorizo and the pico de gallo salsa. I suggest trying the Chorizo Benedict over the Crab or Classic Benedict, especially if you're a fan of Chorizo. I have always had good service at Jak's Grill. The staff is very friendly and attentive to your needs.